Associate Professor Chris Anderson and the University of Mataram engaging with farmers in Dompu District on Sumbawa Island. Massey University is working in partnership with Indonesian farmers and educators to build a more sustainable and successful agriculture sector. 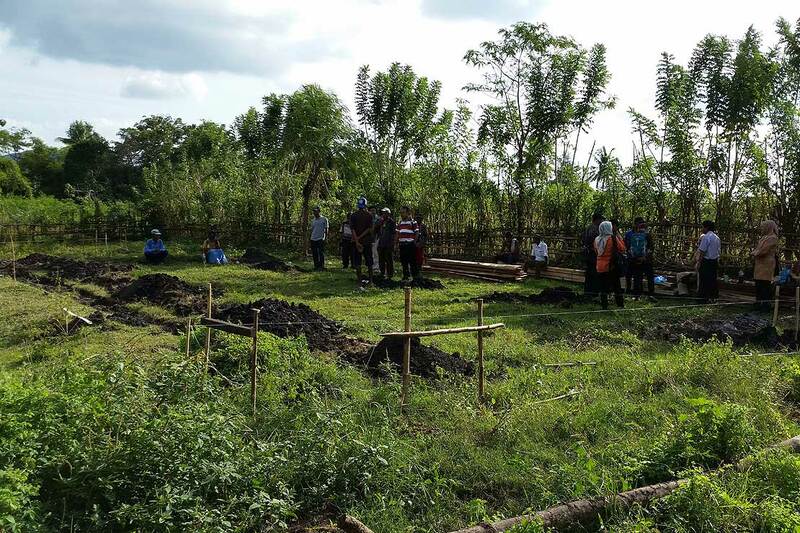 The East Indonesia Innovative Farm Systems and Capability in Agribusiness Activity (IFSCA) is funded by the New Zealand Government, which has contributed $4.2 million through the New Zealand Aid Programme. Massey University College of Sciences Pro Vice-Chancellor Professor Ray Geor attended the New Zealand Indonesia Business forum in Jakarta on July 19. Prime Minister John Key attended and three Massey projects were highlighted, including the East Indonesia Innovative Farm Systems and Capability in Agribusiness Activity. Working in partnership with The University of Mataram, the programme has been operational for just under six months in the districts of Dompu on the island of Sumbawa, and North Lombok on the island of Lombok. The programme draws on the best of New Zealand’s agricultural expertise to integrate the latest tools and technologies into existing corn, cattle and fresh fruit and vegetable farming systems. Work already undertaken has created strong inroads to build technical capability and infrastructure, improve productivity and create new business. “New Zealanders are fortunate to have generations of accumulated knowledge around best practice farming, and sharing that knowledge with other countries can only be good for the prosperity of both,” says Associate Professor Anderson, of Massey’s Institute of Agriculture and Environment. Since its inception, the programme has focused on building human capability by teaching sustainable farming practice on farms through the University of Mataram. The next six months will see the installation of major infrastructure, with the completion of five cattle units that will be operational by the end of the year. A feasibility study is underway to test viability of a packhouse that can better supply high-quality fresh fruit and vegetables to high-end hotels on Lombok’s tourism coast. Initial groundwork for a cattle dry lot in Dompu being built by a farmer group with assistance from the project. At the forefront of the project is the development of long-term relationships that will lead to economic prosperity and research outputs for both countries. The project is part of larger university effort known as Massey University Worldwide that aims to develop the international education market and expand Massey teaching and research activity internationally in order to secure tertiary education as a major export earner for New Zealand. It works within agriculture, humanities and social sciences, aviation, business, emergency management, environment, health and veterinary medicine. Projects include work in South Asia to prevent the spread of zoonotic diseases from animals to humans, strengthening the national veterinary services and the animal production sectors of Sri Lanka – also funded by New Zealand – and involves experts from across Massey and universities across the world. The four-year Indonesian agribusiness development project was launched on February 22 at the University of Mataram on the island of Lombok, east of Bali.